Not up for another hot brown, we didn't have many other options - Kentucky is national chain restaurant central. 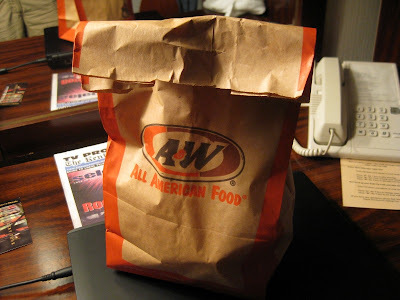 We eventually gave in, and ended up at A&W. And not just any A&W - this one was a joint A&W / Long John Silvers establishment. Complete with a disaffected teenage girl running the till. There are some good places to eat in Bardstown, however, they are a little hard to find. Kreso's is a small family owned Bosnian place on Main Street and they have the best burger in town. Rosemark Haven has great Italian food, but are hidden. You can find them on the internet and Kurtz has pretty good food with the sides served family buffet style. Also for a good steak, I would try BJ's.